Even if you log in to Windows using an administrator account, the applications that you will execute will not necessarily have administrator rights. When TestComplete is launched from a user account, it will not have access to some application processes, since administrator privileges are required for this. Even if TestComplete and your tested application are running under the same user account, they may have different security permissions under Windows 7, Windows Server 2008 R2 or later Windows versions. TestComplete can only “see” and interact with an application if it has the same or a higher level of security permissions than the application. For example, if TestComplete is run with user permissions and a tested application is run with administrator permissions, TestComplete will not be able to see the application’s windows and controls and to obtain properties of the application’s process. If the tested application has user privileges, TestComplete can have either user or administrator privileges. If the tested application has administrator privileges, TestComplete must also have administrator privileges. The next sections explain how you can launch applications with administrator permissions in Windows. On the Shortcut tabbed page, click the Advanced button. The Advanced Properties dialog will appear. Select the Run as administrator check box and click OK.
Now, every time you run TestComplete using this shortcut, you will run it as an administrator. Right-click the file and select Properties from the context menu. Switch to the Compatibility tabbed page. 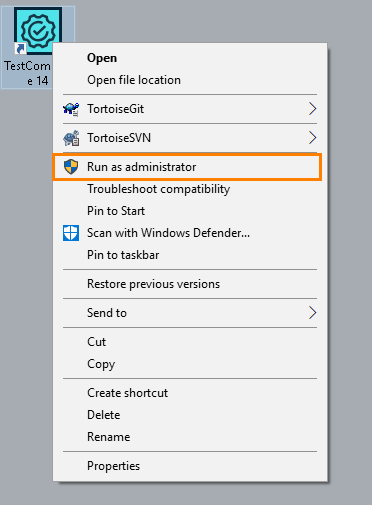 Select the Run this program as an administrator check box and click OK.
Now every time time you run TestComplete – whether via a shortcut, from command line or any other way – it will be run as administrator. When launched with the Compatibility > Run this program as an administrator option, TestComplete cannot recognize Edge as a web browser. If you need to test websites in Edge while running TestComplete as administrator, launch TestComplete using one of the other methods described above. Open Control Panel by clicking Start and then clicking Control Panel. In the search box, type User Accounts and then select the User Accounts applet. Windows will display a dialog box asking for your permission to continue. Click Continue in the dialog. Clear the Use User Account Control (UAC) to help protect your computer check box and press OK.
From now on, Windows will not display confirmation dialogs when you launch an application with administrator privileges. Note once again that changing the settings in the described way will impair the security. You can launch a tested application with administrator permissions in the same manner that was described in the previous section. Note, however, that when a tested application is launched from TestComplete, the application will automatically gain the same privilege level as TestComplete. So if you call the tested application from the context menu of the TestedApps project item or by calling the TestedApps.RunAll or TestedApp.Run method in your script or the Run Tested App operation in your keyword tests, you do not need to modify the application’s properties. Running the tested application in the RunAs mode, that is, under another user account. See Testing Applications Running Under Another User Account. Running the tested application in the Profile mode, that is, under a profiler. Changing the system date and time using the aqDateTime.SetSystemDateTime method. Shutting down or restarting the computer as a part of the test run. See Shutting Down and Restarting Computer After Test Run and Rebooting the Computer During Automated Testing. AQtime integration and coverage testing.